This is a short book for very young children about dealing with the death of a grandparent. The child, who is not given a gender, tells the story of how he or she (I'll use just "he" from now on) used to see Granny on Wednesdays. He remembers the fun he had with Granny and how he loved spending time with her, although he also says she was occasionally grumpy. Then Granny goes to hospital and dies. The adults cry, but the child doesn't understand what is going on. The funeral is strange and confusing. He sits down with his Mama and she talks about death. She explains the ideas of heaven and reincarnation, but says that no one knows for sure what happens. The main emphasis is on the idea that we keep people in our memories through our love. They find a picture of Granny, and at last thinking of Granny makes the child cry, but then it makes him feel good to remember her. Experts say that children are often confused by the mystery and metaphor that surrounds death. For example, if they are told a person has "gone to a better place" they wonder when that person will return and why they can't phone or send postcards. The experts advise people to be straightforward and honest with children, telling them as much as they want to know. Children tend to make up and tell each other bizarre theories if they are curious about a topic and yet are kept in the dark about what truth is. So One More Wednesday should be very helpful to children: it meets those expectations, using simple language that very small children can follow. The illustrations are good. They are black and white sketches, with just one thing in the picture given color: for example, in the picture of the child and Granny baking cookies, her sweater is colored red, while all else is left uncolored. It keeps the pictures simple yet makes them interesting. Similarly with the shapes of the people: they are people shaped, but their heads are odd, a little like cat or dog shaped faces. But that is not off-putting--it just makes them universal, of no particular race or ethnicity, although given the funeral custom and the fact that the Granny lives in a different house from the child's family, it's clearly western culture. This is a sad book, since it is about grief and loss, but it is also full of love and understanding, and I imagine it would be useful for a child who has experienced a death to read. 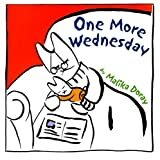 It might even be a good idea for others to read: even if a child hasn't had a family member die, he or she will probably have friends and school mates who have been affected by death, and books like One More Wednesday help children come to terms with death.